More than 1,300-years before the birth of Cleopatra, there was Neferneferuaten Nefertiti (‘the beauty has come’) – a powerful queen from ancient Egypt associated with beauty and royalty. However, as opposed to Cleopatra, Nefertiti’s life and history are still shrouded in relative ambiguity, in spite of her living during one of the opulent periods of ancient Egypt. The reason for such a contradictory turn of affairs probably had to do with the intentional disassembling and expunging of the legacy of Nefertiti’s family (by successive Pharaohs) because of their controversial association with a religious cult that prescribed the relegation of the older Egyptian pantheon. Fortunately for us history enthusiasts, in spite of such rigorous actions, some fragments of Nefertiti’s historical legacy survived through various extant portrayals, with the most famous one pertaining to her bust made by Thutmose in circa 1345 BC. 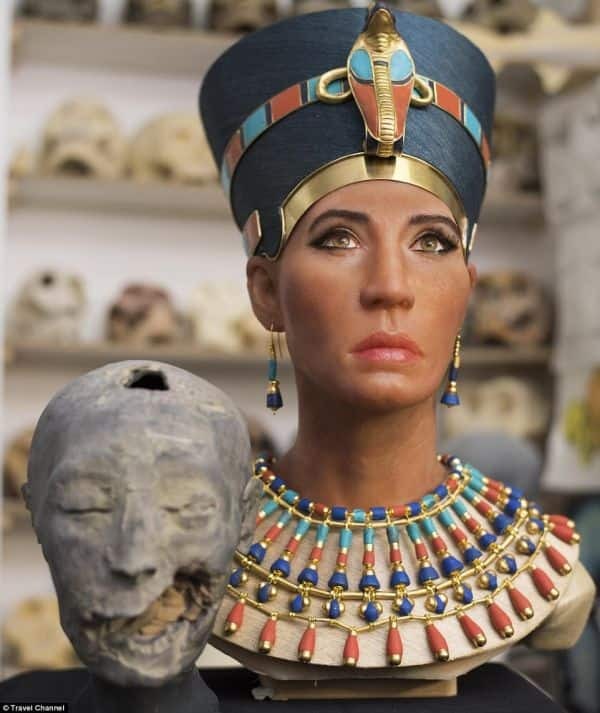 As with many well-known and celebrated historical figures, the common thematic element of Nefertiti’s life pertains to enigma and ambiguity rather than hard facts. The puzzling scope starts with Nefertiti’s parentage. While most sources cite Ay (a future pharaoh) as her father and her birth year corresponding to circa 1370 BC, inscriptions also vaguely mention Ay’s wife, Tiye (or Tey) as Nefertiti’s wet nurse (‘nurse of the great queen’), thus complicating the actual nature of Nefertiti’s lineage in context of her supposed parents. Furthermore, there are (were) other conjectures that tend to identify Nefertiti with Mitanni princess Tadukhipa, which hints at an Indo-Iranian heritage. However, evidence suggests that Tadukhipa was already married to Akhenaten’s father, while there are no discernible sources that could clearly push forth Nefertiti’s alleged ‘foreign’ origins. Simply put, while the Egyptian queen’s parentage is certainly disputed, it might just be a stretch to identify her as a non-native in ancient Egyptian circles. 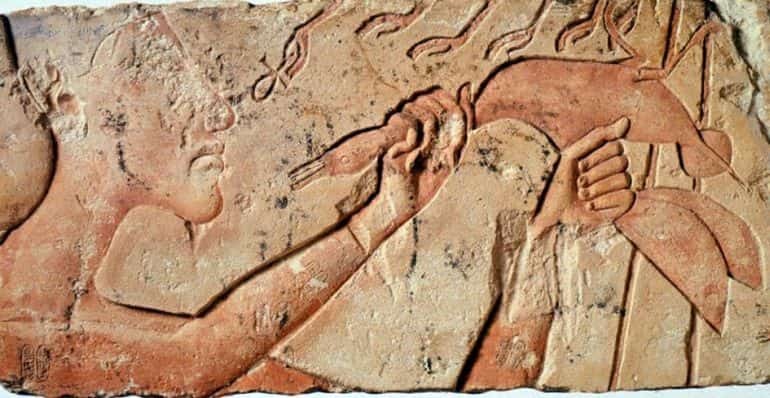 Offering made by Akhenaten to Aten. Quite unsurprisingly, Nefertiti and her sister Mudnodjame were accustomed to the royal court at Thebes from a pretty young age, since their father Ay acted as the vizier to Pharaoh Amenhotep III. In essence, the future queen of Egypt was introduced to the opulent lifestyle expected of the royalty, while also carrying some influence of her own (and her family). Pertaining to the latter, it is interesting to know that Nefertiti was possibly already an initiate of the cult of Aten before her marriage to the son of Amenhotep III. This cult later became the focus of an almost monotheistic (or possibly henotheistic) mode of religious affiliation across all of Egypt, with the worship centered around Aten. 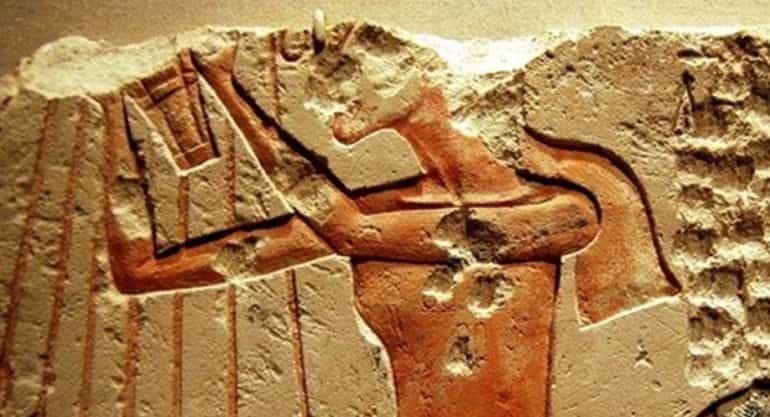 The controversial religious revisions were made during and after the 5th year of the reign of Pharaoh Amenhotep IV (the son of Amenhotep III and husband to Nefertiti), later known as Akhenaten (‘Effective for Aten’), who went on to proclaim that Aten, often personified as the disc of the sun as visible from the earth, was to be venerated above the other Egyptian gods as the ‘true’ creator of the universe, in circa 1348 BC (or 1346 BC). The aforementioned parcel of history expectedly puts forth hypotheses (from some scholars) as to how Nefertiti herself played a crucial role in possibly influencing her husband to adopt the cult of Aten as a state religion, thereby relegating the older Egyptian pantheon centered around Amun-Ra – leading to closure of temples across the realm. However, on an objective level, almost every Egyptian from the period, especially of noble background, tended to favor their own ‘endorsed’ divine entity, and this mode of personal worship necessarily didn’t translate to larger political outcomes. And speaking of political outcomes, while the influence of Nefertiti is unsubstantiated, the contentious decision of relegating the older Egyptian pantheon of gods in favor of Aten was possibly an intentional ploy by the ambitious Amenhotep IV to curb the power and money of the priestly class dedicated to god Amun. Simply put, his radical overhauling of the religious system resulted in a more centralized, state-sponsored religion as opposed to affluence (and donations) being shared by a separate class of people. Nefertiti was married to Amenhotep IV of the Eighteenth Dynasty at the age of fifteen (circa 1355 BC) – possibly an outcome of the warm diplomatic relation shared between her father Ay and the Pharaoh Amenhotep III. The royal couple’s union produced at least six daughters, one of whom went on to become the wife to Tutankhamun (originally named Tutankhaten), Amenhotep IV’s son by his other wife (whose name is still not known but is often given the moniker of The Younger Lady). In other words, Nefertiti may not have been the mother of Tutankhamun, since DNA analysis of the mummy of The Younger Lady has not returned any confirmation of such a lineage. It [Amarna] was laid out parallel to the river, its boundaries marked by stelae carved into the cliffs ringing the site. The king himself took responsibility for its cosmologically significant master plan. In the center of his city, the king built a formal reception palace, where he could meet officials and foreign dignitaries. The palaces in which he and his family lived were to the north, and a road led from the royal dwelling to the reception palace. 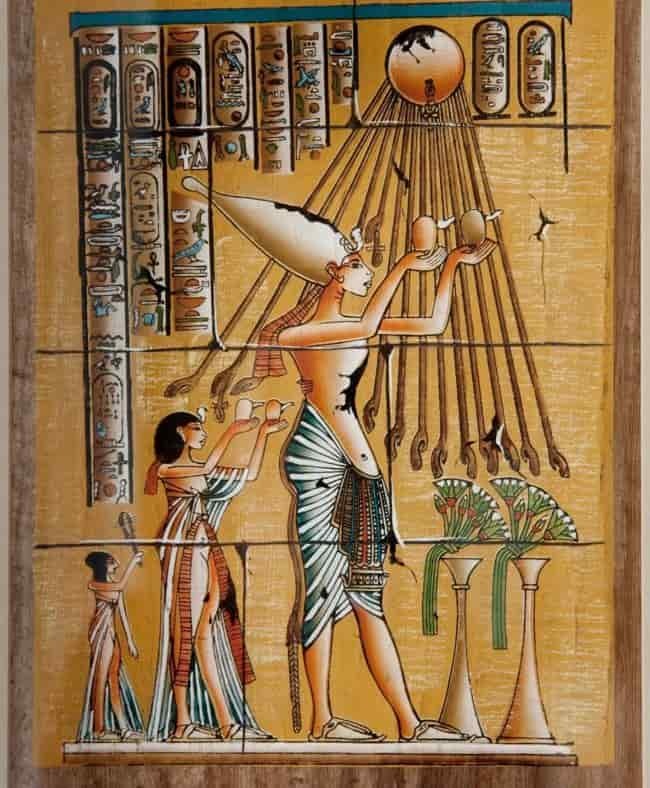 Each day, Akhenaten and Nefertiti processed in their chariots from one end of the city to the other, mirroring the journey of the sun across the sky. 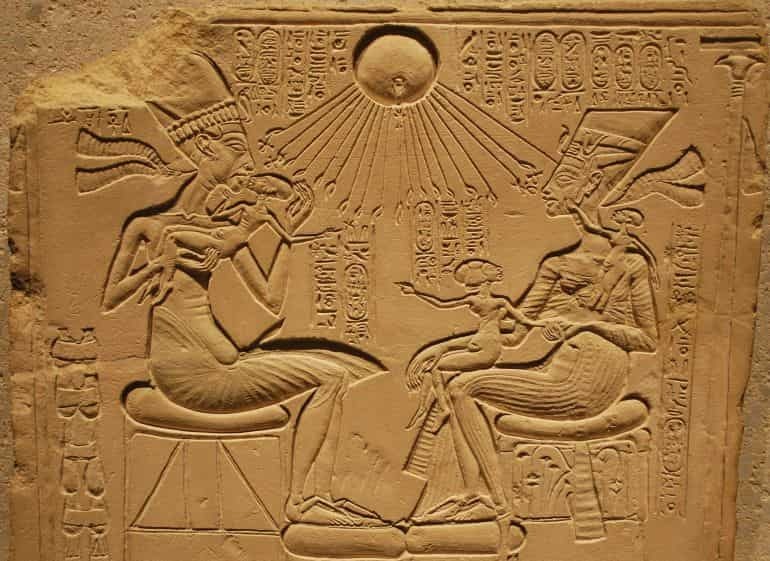 In this, as in many other aspects of their lives that have come to us through art and texts, Akhenaten and Nefertiti were seen, or at least saw themselves, as deities in their own right. It was only through them that the Aten could be worshipped: they were both priests and gods. Beyond symbolism, Amarna also flaunted effective building designs, like the adoption of standardized stone bricks known as Talatats that were easier to manage than unwieldy huge blocks of stone. And interestingly enough, the scenes covered by these brick facades tended to display Nefertiti almost twice as much as her husband Amenhotep IV (by then known as Akhenaten). Some of the representations even project Nefertiti with an air of pharaonic power, like scenes portraying the queen officiating at religious functions, heading diplomatic meetings and even smiting the enemies of Egypt. Furthermore, Amenhotep IV was known to have merged his royal seal (cartouche) with that of Nefertiti, thereby implying the equality of power shared by the royal couple, in spite of Nefertiti’s official designation as the Great Royal Wife. In practical circumstances, this might have translated to scenarios where Nefertiti fulfilled the traditional duties of a Pharaoh as a co-regent, especially during times when Akhenaten was involved in his radical theological projects concerning monolatry (worship of a single idol). 6) Nefertiti as an ‘Elusive’ Pharaoh? By the end of the Amarna Period, and possibly after the death of Pharaoh Akhenaten (husband of Nefertiti) in circa 1336 BC (or 1334 BC), the Egyptian throne passed on to a mysterious figure known as Smenkhkare, whose identity or even gender is not known to Egyptologists – with one lingering conjecture alluding to how this ruler was the alter-ego of Nefertiti (although many also consider that to be an anachronistic theory). In the chronological scope, Smenkhkare had a pretty short reign of a few months and was succeeded by yet another mysterious Pharaoh known as Neferneferuaten. Pertaining to the latter, there is a general notion shared by most academics that Neferneferuaten, by virtue of the name’s feminine traces, was possibly Nefertiti herself (or her daughter Meritaten, who in turn, was possibly married to the earlier Smenkhkare). Quite intriguingly, Neferneferuaten also used the epithet Akhet-en-hyes (“Effective for her husband”) in her royal cartouche, which rather bolsters the hypothesis of Nefertiti ruling over Egypt as a sole Pharaoh after the death of her husband. It is also entirely possible that Nefertiti, as Neferneferuaten, might have even reversed some of the radical forms of Aten worship in a bid to appease various sections of the ancient Egyptian society. Earlier theories in the academic circles painted a picture of how Nefertiti, during the last years of the reign of Amenhotep IV, fell out of favor in the royal court, possibly because of her ‘inability’ to produce a male heir. Such conjectures were drawn from the apparent sudden disappearance of Nefertiti’s historical records from around the Year 12 of Amenhotep IV’s reign. However, Amenhotep IV already had a male heir (Tutankhamun) by one of his other wives (previously thought to be noblewoman named Kiya, but later confirmed to be The Younger Lady). Furthermore, in 2012, archaeologists came across a Year 16 record from Amenhotep IV’s reign that clearly did mention the presence of the “Great Royal Wife, His Beloved, Mistress of the Two Lands, Neferneferuaten Nefertiti”. In any case, Nefertiti probably lived for years after the demise of her husband Amenhotep IV and possibly even ruled as a female Pharaoh before the advent of Tutankhamun – as mentioned in the earlier entry. But in spite of Nefertiti’s status and achievements, her own death is still mired in mystery, with numerous conjectural reasons being put forth, ranging from a plague to natural illness. The year of her death is often presented as circa 1330 BC, thus establishing her age to be 40 (or around the late thirties) during the time of her passing. Unfortunately, archaeologists have not been able to (definitively) identify either her mummy or tomb. A chance discovery made in 1913 by German archaeologist Ludwig Borchardt led to the century-old appreciation of ancient Egyptian art and beauty. The discovery in question here pertains to the renowned Nefertiti Bust, a painted gypsum-coated limestone sculpture, currently kept at the Neues Museum in Berlin, that is widely believed to be one of the masterpieces of sculptor Thutmose, dating from circa 1345 BC. The bust with its bevy of intricate facial features favorably depicts the ancient Egyptian Queen Nefertiti, possibly at the age of 25. In terms of the visual look, what we do know about Nefertiti, also comes from the royal portrayals on the numerous walls and temples built during the reign of Pharaoh Amenhotep IV. In fact, as we mentioned earlier in the article, the depiction styles (and prevalence) of Nefertiti were almost unprecedented in Egyptian history till that point, with the portrayals quite often representing the queen in positions of power and authority. 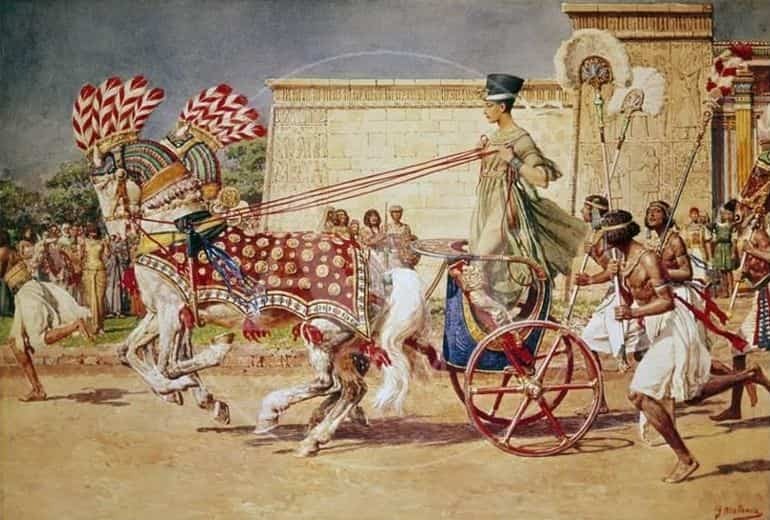 These ranged from depicting her as one of the central figures in the worship of Aten to even representing her as a warrior elite riding the chariot (as presented inside the tomb of Meryre) and smiting her enemies. 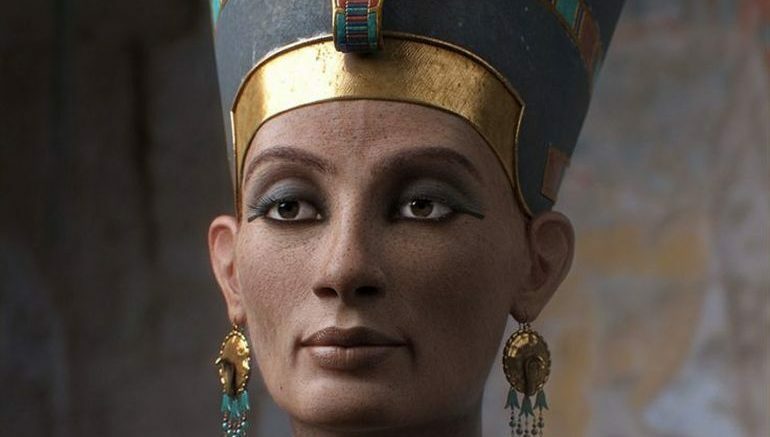 I’ve seen artists try to bring out the living likeness of Queen Nefertiti many times, and some of the most famous attempts, though good in and of themselves, always seem to adjust her facial features to match certain contemporary standards of beauty in some way, which really isn’t necessary because the original bust of Nefertiti is already so beautiful and lifelike. I took the chance of leaving the bust’s features entirely as they are, only replacing the paint and plaster with flesh and bone. The result is absolutely stunning. Interestingly enough, back in 2016, researchers from the University of Bristol also came up with their recreation of an ancient Egyptian queen, but the project was based on the mummy of The Younger Lady – the biological mother of Tutankhamun (and wife of Amenhotep IV), who was never proven to be Nefertiti herself. 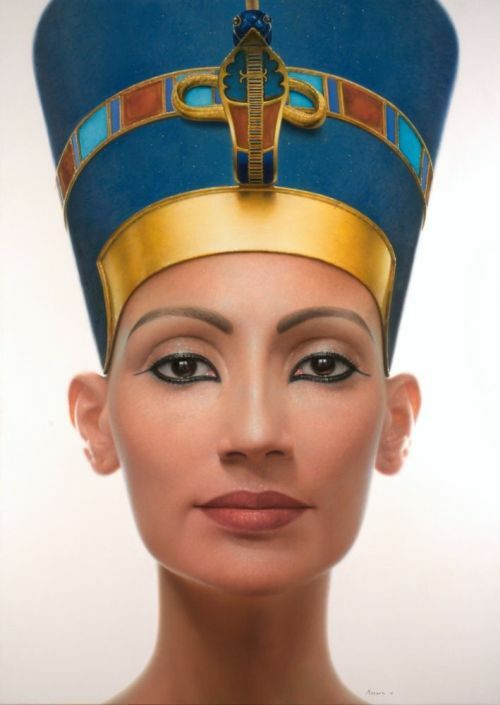 Featured Image: Nefertiti Reconstruction by Sven Geruschkat.